This formulaic, Michael Mann ripoff isn’t bad — it’s quite entertaining — but the plot is virtually non-existent and any audience member well versed in police dramas will have figured out how it all will end well before the final scene. It’s easy to watch and will keep you engaged, but there’s nothing really smart or groundbreaking with its classically dull “and then this happened” storytelling style. It’s just another run-of-the-mill dirty cop movie. The film is flashy, stylish and well made by director John Hillcoat, but looks aren’t everything. Sadly, he was woefully unable to elicit great performances from the star-studded cast. How great is the cast? We’ve got Chiwetel Ejiofor, Kate Winslet, Aaron Paul, Clifton Collins Jr., Anthony Mackie, Norman Reedus, Woody Harrelson, and Casey Affleck. (You’d be a fool to not want to see this movie based on the actors alone)! Problem is, this movie is so stuffed with talent that most of it is completely wasted. I wanted to see more of Affleck and Harrelson (channeling his far superior role as Marty Hart on “True Detective“). And poor Teresa Palmer, she’s just in the movie as screen dressing for a few scenes (and she’s half naked in most of them). There’s just too much going on for any of the characters to have a chance to be fully developed, and that’s a shame. In “Triple 9,” celebrated indie director John Hillcoat gives us a world populated with corrupt cops, war heroes, criminals, and gangsters where there is no solid line dividing the good and bad; instead, there are only shades of grey. Supported by a who’s who list of actors — including Anthony Mackie, Casey Affleck, Aaron Paul, Chiwetel Ejiofor, Woody Harrelson and Kate Winslet — “Triple 9” is an ideal fit for the lover of crime dramas. Hillcoat knows these characters and the world they live in. We have been here before in his previous movies, “Lawless,” “The Road,” and “The Proposition.” As in those movies, we are challenged with picking one character to identify with and root for. For most of his characters, we can understand their motivations and sympathize with them on some level, at the same time we dislike them on another. While heists drive the story, they do not control it; the characters do. As for the latter, we have a number of chances for brief glimpses into their backstories that give us just enough — but not too much — information to help us understand why they do what they do. We care enough about them that when they are in peril, we are invested and worried for their safety. It is our investment in these characters and their survival that drives the suspense. We want them to do the right thing, and we want them to survive. 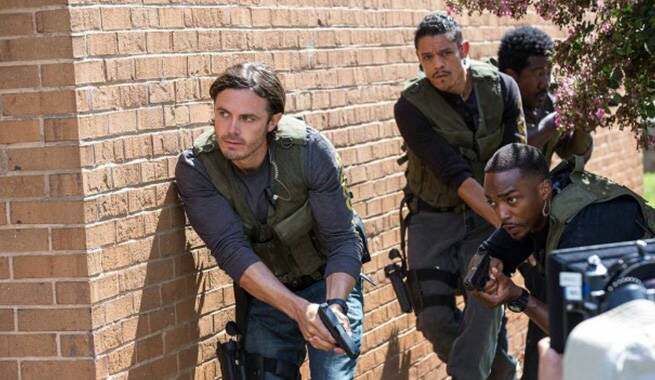 While it’s far from a perfect movie, “Triple 9” is a strong and worthy entry in the corrupt cop / crime drama genre, and definitely one worth seeing.